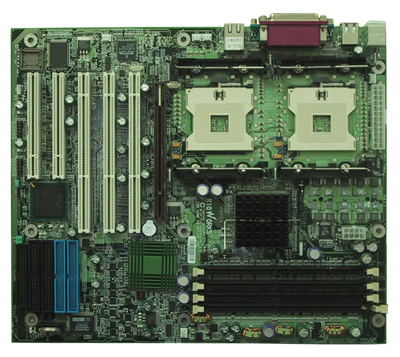 PDPEA, a dual socket-604 motherboard, support the latest Xeon processor for providing the powerful platform to satisfy today's needs on highly integrated performance workstation. Build-in the latest E7505 - Intel's high-performance workstation chipset, PDPEA scales up the whole server performance by supporting dual Xeon processors, DDR memory, PCI-X bus and ATA133 IDE RAID. Furthermore, PDPEA also integrates a Gigabit Ethernet controller, an AGP8X solution and provides an optimal platform for performance workstation environments. ATX form factor with size: 12" * 10"